​If you can do body care without man-made chemicals...why wouldn't you?? What's better than Organic? Non-Toxic! Just imagine looking at the ingredient label of a product and not having to Google anything! That is our mission! We challenge you to attempt that with ANY commercial product currently in your home. 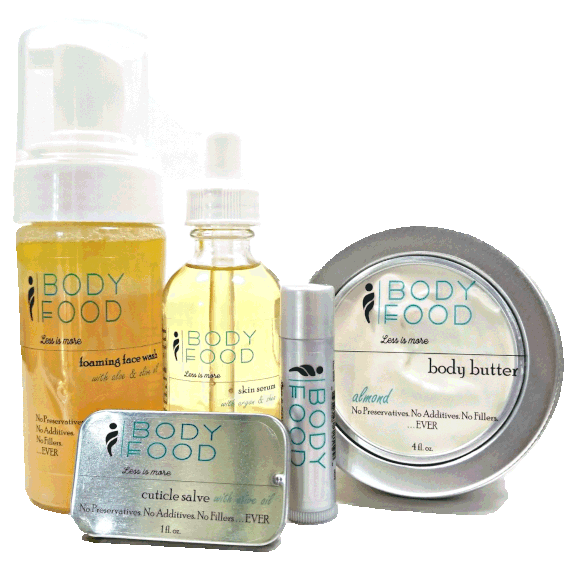 Body Food® products are the answer!! Our number one priority is to provide healthy alternatives for those looking to reduce their exposure to potentially harmful and toxic chemicals found in everyday body care products. ​There are absolutely NO chemicals or preservatives added! No man-made synthetics whatsoever...not a one...and no needless fillers! ​Another unique difference with our product line, as opposed to other health-conscious hand crafted lines, is that with very few exceptions, the products do not contain any essential oils. Why not? Aren't essential oils fabulous? Why yes they are...but they are powerful, therapeutic elements and, we believe, should be used judiciously and intentionally, not willy-nilly for fragrance and the like. We encourage folks to add their own in, but in their original form, we want the products to be as simple and pure as they come for the most sensitive individuals who may be in search of products that do not incite allergies, rashes, reactions, or anything in between. That doesn't mean folks without these issues will not enjoy the pure satisfaction of luxurious products without the junk, but for folks who have suffered at the hands of the mainstream market and all their chemical additives, this line is a fantastic alternative!! Whoever you may be, thanks for stopping by and happy shopping!!! This all started with a girl and her love for essential oils. The original fragrance free body butter was birthed out of an inability to find a simple, healthy base cream to mix oils into. From there grew a passion to bring to market simple, understandable products that are great alternatives to commercial, chemical filled ones.